Ian D. Hosein is on a roll. Since the first of the year, his research in developing new materials with advanced capabilities has earned him the selective 3M Non-Tenured Faculty Award (NTFA) and front-page coverage in two journals, Physica Status Solidi A and Advanced Engineering Materials. These accomplishments follow a productive 2018 in which the assistant professor in biomedical and chemical engineering earned a National Science Foundation (NSF) CAREER Award and delivered a TED talk at Clarkson University. 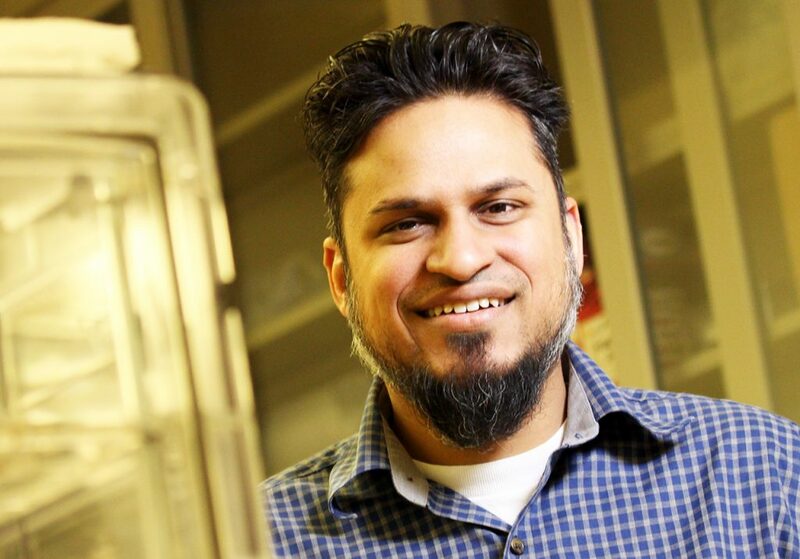 Hosein was awarded his 2019 3M NTFA for his proposal, “Advanced Polymer Materials for Energy Conversion and Storage.” His work was selected from more than 100 nominations from over 60 academic institutions across the country. He is set to receive $45,000 in funding over three years and will participate in a showcase of his research at 3M’s Science & Engineering Faculty Day this summer. His research, “Prototyping of Superhydrophobic Surfaces from Structure‐Tunable Micropillar Arrays Using Visible Light Photocuring,” will be featured on the cover of Advanced Engineering Materials this July. Here, he and his research team—Hansheng Li, Fu-Hao Chen, and Saeid Biria—detail their work “writing with light” to photocure an array of rod-shaped pillars at the microscale. The array forms a surface structure on a transparent material that prevents water, fog and ice from collecting on its surface, making the material ideal for windows, solar panels and eye wear. In February, his research, “Enhanced Wide‐Angle Energy Conversion Using Structure‐Tunable Waveguide Arrays as Encapsulation Materials for Silicon Solar Cells,” was highlighted on the cover of Physica Status Solidi A. This work improves the amount of sunlight solar panels can collect to help allow solar energy to take on a larger share of our energy solutions. Along with Biria and Chen, Hosein uses arrays on the surface of a solar panel to allow more sunlight to be absorbed when it hits the panel over a wider angular range, such as over the course of a day or across seasons.